Developing and maintaining a solid Affirmative Action Plan is one of the biggest contributors to my clients’ hiring headache. Especially when trying to stay on top of the latest trends. ApplicantPro does Equal Opportunity Employment a little differently, so I’d like to give you a brief overview of what I’ll be discussing in Thursday’s Affirmative Action Plan Tracking Webinar. The general rule of thumb is: first tier government contractors with $50,000 or more in federal government contracts or 50 or more employees at one location and the second tier government contractors (supplies to a 1st tier contractor) with $50,000 or more in contracts of 50 or more employees at one location. Also, any company that deals a lot with city and state business or organizations looking to land government deals, needs an AAP. This list is by no means exhaustive, but it’s a good start: Job Requisition Approvals; Job Ad Posting Locations; Collection of Race/Gender on Applicants; NEW Vets & Disabled Rules Pre-offer; Minimum Qualifications Met; Hiring Approval Documentation; NEW Vets & Disabled Post-offer; Applicant Log of Disposition Codes; and Vets & Disabled Reports. What does the Req Process Look Like? Job Requisition Approvals generally include: Position and Description; Reason for Opening; Suggested Pay Range; Job Type/Classification; Qualifications for the Job; and Proof of Approval through Chain of Command. What Do I Need to Know About Minimum Qualifications? When it comes to tracking minimum qualifications, this is what should be included: Collect Minimum Qualifications on Req; Create direct screening questions and record answers from applicants; Flag in Spreadsheet Y/N Met Basic Qualifications; May or may not need included on log report depending on your plan; “Basic qualification” screens may not screen out on the basis of disability unless job-related and consistent with business necessity. What are the Challenges Associated with Tracking AAP Manually? 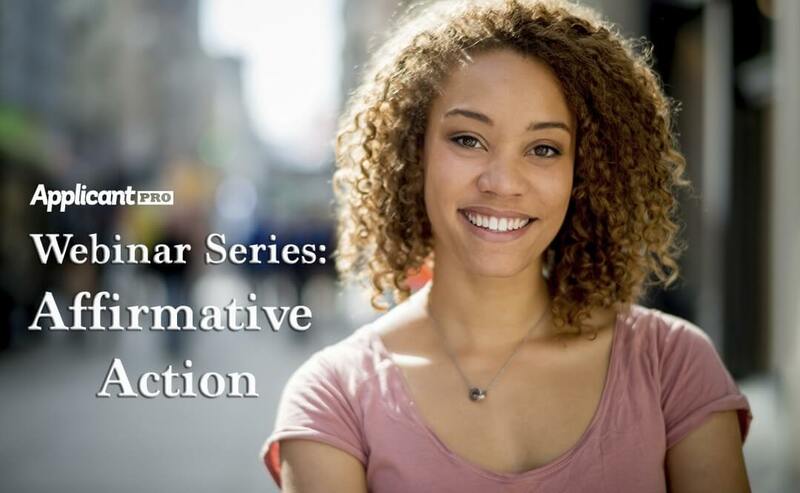 Feel free to join me, for our free HRCI approved webinar on Thursday March 27, at 11 AM MST to learn how to overcome the pitfalls most employers face when trying to create a consistent and efficient Affirmative Action Plan.